The region is dominated and defined by two significant river catchments, the Whanganui and the Manawatu. The Whanganui River, in the northwest, is the longest navigable river in New Zealand. The river was extremely important to early Māori as it was the southern link in a chain of waterways that spanned almost two-thirds of the North Island. It was one of the chief areas of Māori settlement with its easily fortified cliffs and ample food supplies. Legends emphasise the importance of the river and it remains sacred to Wanganui iwi. Māori along the coast and lowland plains grew kumara and other crops. The Manawatu River runs across the centre of the region, from rolling hill country in the east to the fertile Manawatu Plains in the west. The main city of Palmerston North is located on these plains, and is an important service city for the southern North Island as a whole. This river is unusual, in that it passes from hill country to plains through a gorge cut into much higher country, an indication that the hills have risen since the river formed. The two river catchments have very different natures. While the open Manawatu Plains became more densely settled by Europeans, inland Ruapehu, Rangitikei and Wanganui remained more Māori-dominated, remote and independent, and is still heavily forested. As late as the 1950s the Whanganui River remained a river of mystery. Since then exploitation of the river's commercial potential has opened up the area, often causing friction with local Māori, who have long-standing grievances. Manawatu-Wanganui as a whole is one of the most important pastoral areas in New Zealand, its status recognised when the government opened the Massey Agricultural College in the 1920s. The area includes a variety of landscape formations. Districts close to the Volcanic Plateau are higher and more rugged, often subject to harsh temperatures in winter. The Manawatu District has a much gentler topography, consisting mainly of the flat, tree-studded Manawatu Plains that run between the ranges and the sea. The land was under the sea till about 500,000 years ago and still has a very thick layer of marine sediment, which is about five or six million years old. A block faulting system underneath the thick sediment has raised a series of domes and gentle depressions. These structures can provide natural storage areas for oil and some of the Manawatu domes have been drilled. The domes have shaped the course of the Manawatu River, giving it a meandering path which, uniquely among New Zealand rivers, begins close to the east coast and exits on the west coast. The Manawatu River begins just inside the Hawke's Bay region, then flows through a deep gorge to the Manawatu Plains before exiting in the Tasman Sea. The river is also unique in New Zealand (and rare worldwide) in that this gorge (the Manawatu Gorge) is a water gap through recently uplifted rock, causing the river to flow from relatively low lying land along an eroded course through higher terrain. The Wanganui District is more rugged, with canyon-like valleys and gorges carved out of the soft rock by rivers and ocean waves. There are two major urban areas. 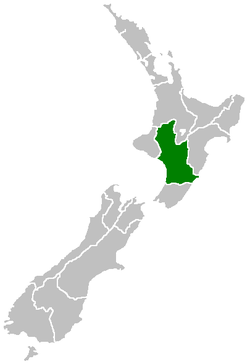 Palmerston North, with a resident population of 85,300 (June 2012 estimate), expanded as an educational centre and a supply centre for the surrounding rural hinterland. It became a city in 1930. 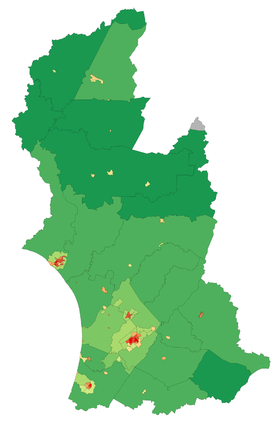 The other major urban area is Wanganui/Whanganui, with an estimated resident population of 39,500 (June 2012 estimates). Other urban centres include Levin (19,550), Feilding (14,600), Dannevirke (6,000), Taumarunui (5,000), Foxton (5,000), and Marton (5,000). The region also includes the smaller towns of Bulls, Ohakune, Waiouru, Raetihi, Taihape, Woodville, Pahiatua, Eketāhuna, Ashhurst, Foxton Beach, Turakina, Sanson, Shannon and Manakau. City life does not dominate, as half the population live outside a large urban area, over a third in small towns or rural areas. While manufacturing has become an important part of the economy, most businesses are agriculturally based and agriculture remains the linchpin. The dominance of agriculture, combined with the relatively small scale of most urban areas, gives a rural quality to the region, quite distinct from the neighbouring Wellington Region. The rugged interior has become one of the main training areas for New Zealand's defence force, which maintain three bases in the region. Its rural nature leads to different recreational practices from more urban areas. In 2010 the Royal New Zealand Society for the Prevention of Cruelty to Animals criticised Colyton School and other schools in the area for running "possum-tossing contests", which involved throwing dead possums. The Society said that "While it's technically not illegal, it's morally wrong to throw a dead animal around". The principal of one of the schools said that the contest helped pupils to engage with the outdoors and had also included education about humane methods of possum control. A local newspaper editorial argued that the schools were in rural areas which had different practices, "both traditional and otherwise", to those of urban areas. 1820–40 Ngati Toa and Te Atiawa iwi displace local iwi from their lands. 1830 Te Rauparaha (Ngati Toa) lay siege to Putiki Pā in retaliation for an attack on Kapiti Island, sacking the pā and killing its inhabitants. 1831 European traders arrive in Wanganui, led by Joe Rowe, supposedly a dealer in preserved heads (moko mokai). A dispute with local Māori leads to the death of three of his party and his own head is cut off and preserved. 1840 Jerningham Wakefield (Edward Gibbon Wakefield's son) purchases 40,000 acres (160 km2) of land under dubious circumstances, for the New Zealand Company, including the Wanganui town site. The first European settlers start arriving in Wanganui. 1866 Palmerston North (Te Papai-oea) is founded. It is surrounded by forests with the Manawatu River serving as its only link with the port of Foxton and the outside world. 1878 A railway line opens between Palmerston North and Wanganui. The first portion later became part of the North Island Main Trunk Railway, between Aramoho and Wanganui the Wanganui Branch, and the rest part of the Marton - New Plymouth Line. 1960s Famous New Zealand poet James K. Baxter sets up a commune at Jerusalem. State Highway 1, the main highway, and the North Island Main Trunk railway, which both link Auckland and Wellington, run through the region. The Palmerston North–Gisborne Line and State Highway 3 follow the Manawatu Gorge, linking the region with Hawke's Bay. The Marton–New Plymouth Line provides a railway link with Taranaki, and from this line the short Wanganui Branch runs to Wanganui. Road and rail transport give the region's exporters easy access to ports. ^ "Row over NZ possum-tossing contest". 23 September 2010. http://www.bbc.co.uk/news/world-asia-pacific-11397239. Retrieved 19 June 2013. ^ "Change flows from big flood". stuff.co.nz. 2012. http://www.stuff.co.nz/manawatu-standard/news/4202272/Change-flows-from-big-flood. Retrieved 27 March 2012. "It dealt a 100-year flood to Palmerston North, and a 250-year flood to other parts of Manawatu." Quickstats about Manawatu-Wanganui Region 2006 Census, Statistics New Zealand. This page uses content from the English language Wikipedia. The original content was at Manawatu-Wanganui. The list of authors can be seen in the page history. As with this Familypedia wiki, the content of Wikipedia is available under the Creative Commons License.